The BJP high command has reportedly pulled up its leader H Raja for his Facebook post claiming that Dravidian leader Periyar’s statue too would be toppled from public places in Tamil Nadu. This morning, Raja tendered an apology for the post but blamed it on the person who manages his FB account for without his consent. 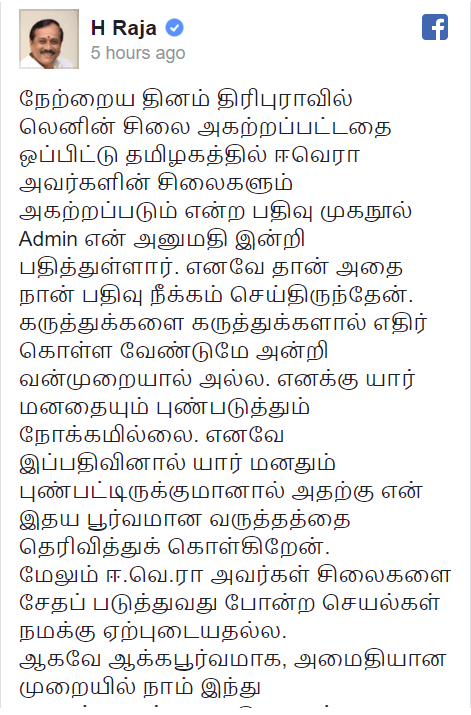 “The post regarding the Periyar statue was posted without my consent. So, later, I removed the post. We should counter views with views and not with violence. I don’t have any intention to hurt the feelings of anyone. If my post had hurt anyone, I express my wholehearted regret. Further, damaging the statue of Periyar is not acceptable to us,” Raja said in his FB post today.